When I adopted the internet as a part of my life back in the early years of this millennium, one of the biggest things in town used to be chatting – instant message based conversations that were the new “in”. In fact, if I recall even further back, chat rooms were even a bigger hit, making it possible to meet new people and make new friends using the power of the internet in a very public environment. While that edge may have rubbed off in the last few years, even today, IRC rooms remain popular amongst certain specific communities. The advantage that IM clients held over these chat rooms, however, were the privacy, and the fact that you could control who can contact you etc. There was more customization in how your messages appeared, too, and quite a few other distinctive features. One of the most popular IM clients ever has been what the world today knows as Microsoft’s Messenger. The then-called MSN Messenger has comes a long way to become what it is now, and with its system level integration in Windows 8, Microsoft has made the program even better. Long back, it was already possible to link your Facebook profile with Messenger, making it easier to keep in touch with your friends from both platforms, and then, when Microsoft acquired Skype, it seemed to be only a matter of time when a unified platform would’ve emerge. Well, it seems like that time has come, or, being precise, would come finally on April 8 this year, when Microsoft would finally flip the switch off on Messenger and make Skype its unified baby for instant messaging, voice calling and video conferencing. 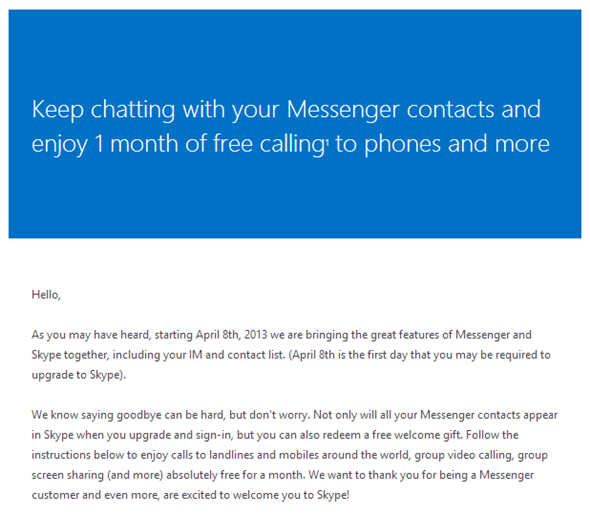 Users of Messenger have started receiving emails from the Messenger team urging them to “upgrade to Skype”, stating that April 8th would be the day when people “may be required to upgrade to Skype”, indicating that the upgrade would most likely be forceful and mandatory. Not only that, Microsoft is also pushing for early adopted, enticing them with promises of one month of free calls to select countries in the Latin America on landline and cellular phones. 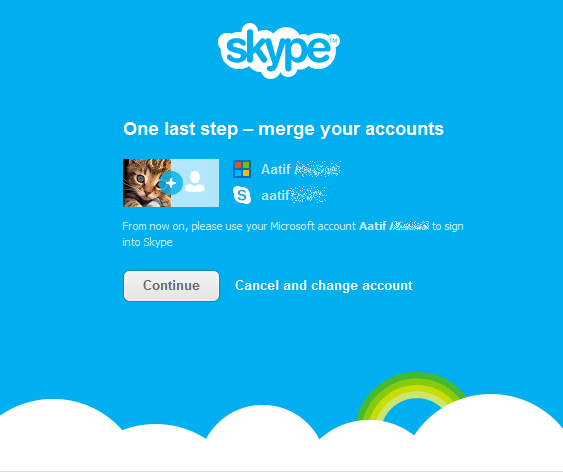 The upgrade is not a complicated matter at all, and should you wish to jump the bandwagon sooner than later, all you need to do is sign in to the traditional Skype application on your PC with your Microsoft account. Once validated, you will be able to change the contact view to list only your Messenger contacts, Skype ones, or a unified view of all.